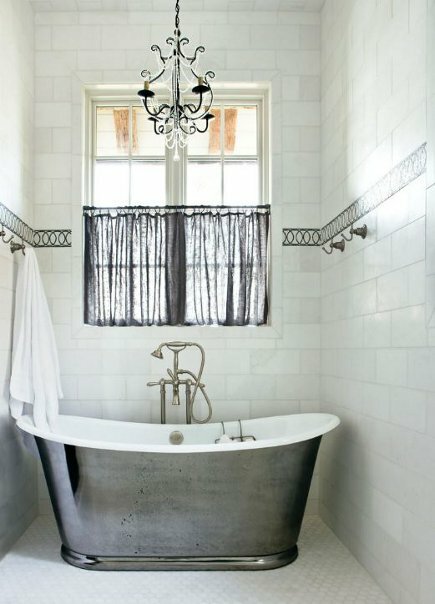 Glamorous freestanding silver bathtubs are amping up the master bathroom glitz. Silvery metallic finishes, such as nickel and chrome, are not just for faucets any more. These cool tones are being applied to the exteriors of stand-alone tubs and turning them into glamorous silver bathtubs that have become focal points for master baths with ever more luxurious surfaces. Slipper tubs are favored for their rolled rims and sculptural qualities. 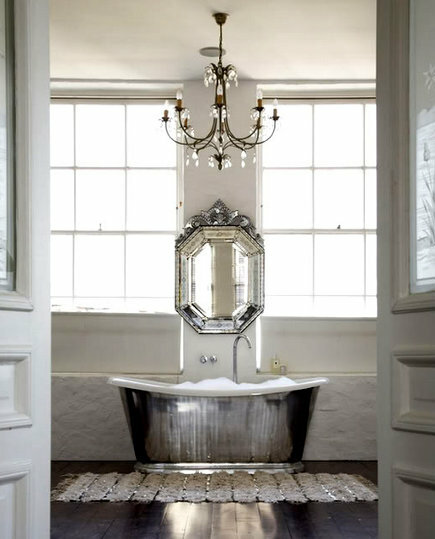 Whether new or old, silver bathtubs have an ability to project a high-quality “stately home” look. One of the oldest silhouettes for slipper tubs is the pedestal or skirted base, which raises a tub slightly above the floor – like the prized vase it is. While the sides may be a bit high and steps may be needed for the less than agile among us, a silver slipper bathtub is always an unqualified statement-maker. The texture of small-scale stone tiles on the walls and floor of a bath [top] by English designer Max Rollitt, sets off the reflective slickness of the tub finish to perfection. There’s plenty of visual room left for the embellished console sink plus a no-barrier shower (note the ceiling-mounted shower head and central drain) in between. White walls make a natural partner for a silver slipper in this stark space. The Venetian mirror sets up high concept vibe that makes this look like the backdrop for a fashion shoot. In an Alabama lake house, the slightly burnished look on the tub’s finish is used to key off the curtains and the looping liner tile in what would otherwise be an industrial-look bathroom niche. Glass tile walls and the Roman shade soften up the tiled window bay that is tailor made for a bath with a view. I frankly find the lanterns mystifying in this setting – but the towels look so soft I’m ready to move right in. 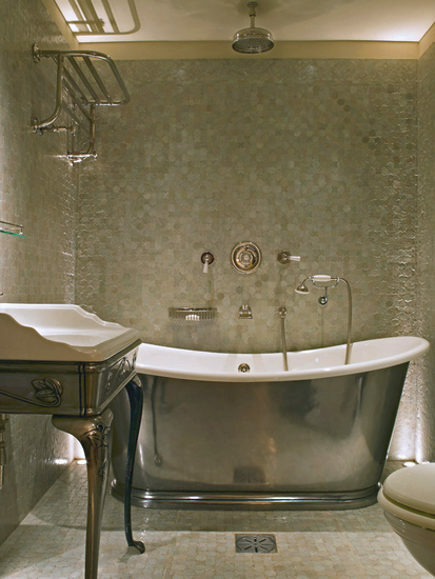 The bespoke British firm Drummond’s makes several ranges of tubs with silver finishes. I fell hard for the mirror-polish of the Usk, a chameleon that reflects the natural wood of the floor. Our Violet Slipper Bath gives another take on this tub style. I so regret not getting a stand along tub when we built. If there is ever another, I will be getting a double slipper! Love the tiled wall in the first bath and the romantic look of the second one. Oh gosh. We are dreaming about a freestanding tub. These are all dreamworthy.